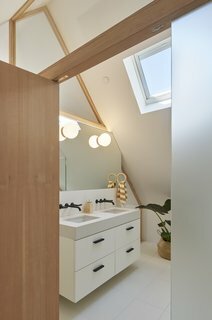 After being tapped by a young, growing family to transform an existing attic into a more accessible, functional space, San Francisco–based Mork-Ulnes Architects went above and beyond exceptions. 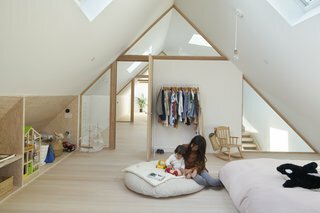 The result is a two-story volume carved in the center of the home that connects the existing living areas to daylight-filled attic spaces above. This modern intervention now provides an open feel to what once was a fairly fragmented home. 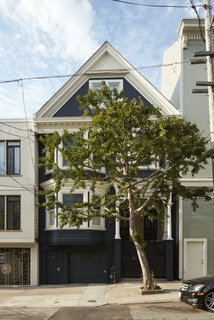 This dark-blue 1907 home appears to be typical of the Victorian character that was evident in early 1900's residential architecture. Unbeknownst from the outside are the bright, light-filled interiors and modern interventions. The new gabled attic floor plan is arranged in a linear fashion, with two bedrooms divided by a series of partition walls. The open stairwell separates the master bedroom, closet, and bath from a second bedroom. 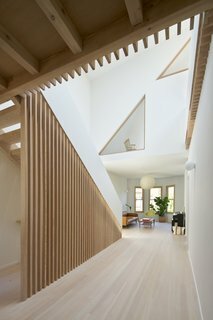 Located at the center of the home, the new two-level atrium connects the existing living areas to the attic spaces above. 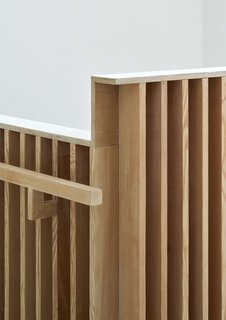 Douglas fir wooden slats follow the slope of the stairs and continuously wrap around as a guardrail, drawing the eye up and around. By incorporating framed glass openings into the drywall partitions, acoustical privacy is still achieved while allowing transparency and continuity between the separate rooms. The addition of skylights draw plentiful daylight into a typically dark, confined space—creating a feeling of grandeur and openness. Wood framed glazing follows the slope of the gable above, referencing the original roof shape of the home. 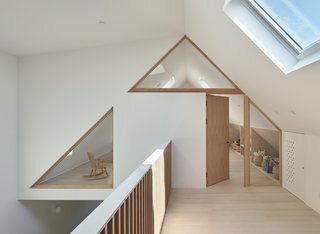 Glazing allows visual transparency between spaces, as well as the passage of light from one end to the other, creating a bright, light-filled attic space. A quaint sun-deck becomes a hidden surprise off the master bedroom. In the master bath, an IKEA vanity with matte black wall faucets from the Jason Wu for Brizio collection continue the simple, contemporary feel of the home. Skylights allow light to enter even the most private of spaces. 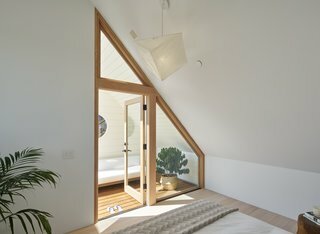 With a simple, refined material palette, the architects were able to connect the new sleeping quarters with the main living spaces below. 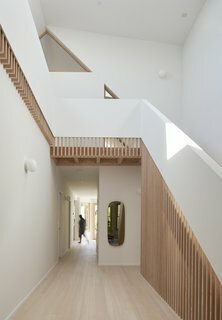 Wood elements carry from floor to floor, connecting existing to new through continuous, thoughtful detailing. 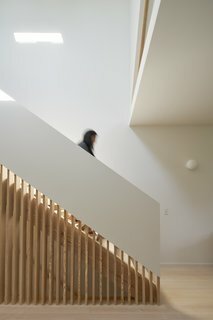 By incorporating wood slats into the stair wall, light from above is able to pass farther into the space between levels. From the wood casework details and window frames, to the angular expressions and wooden guardrail, wooden framework is the unifying detail that blends old and new while also echoing the original structure within the modern shell. Simple, refined details transform this atrium space into a contemporary, architectural solution that blends nicely with the existing framework. 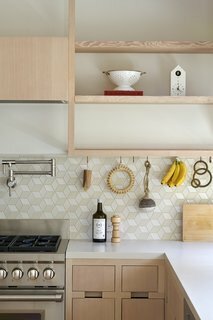 Customized whitewashed woodwork with Caesarstone Fresh Concrete counters and a geometric Health Tile Little Diamond backsplash carry the neutral palette from the atrium into the kitchen. A Mooi pendant adds a nice subtle accent. 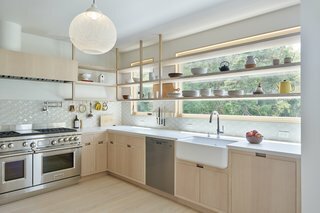 Open wooden shelving serve as an idyllic spot to display special kitchen gadgets and trinkets. 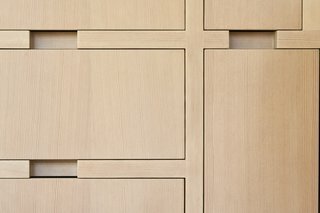 The custom wood joinery uniquely eliminates the addition of pulls through a recess in the cabinets. The whitewashed wood with a matte sealer is a sleek, modern finish that blends nicely with the wooden slats in the atrium.